Twoeyes works with enterprise leaders to attract resources, build teams, grow market share, beat competitors, satisfy stakeholders and deliver targeted returns to Boards and shareholders. Our clients are typically bold, ambitious entrepreneurs driving early-stage, high-growth ventures; the owners of more mature and established businesses or the Boards and CEOs of large, private and not-for-profit organisations. In common, they have the ‘Ability, Attitude and Vision’ required to outperform their industry and succeed. They are not satisfied with the status quo. They want to create a valuable business that realises its vision and meets the needs and expectations of key stakeholders. We help prepare some businesses for capital raising and growth; we work with not- for-profit Boards and CEO’s to clarify their strategic and operational plans and find innovative and creative ways of generating new and sustainable revenue streams; we assist growing and mature companies to get ready for a strategic sale to a corporate buyer. In some cases, we assist business owners in preparing to pass on the business to a known successor. In other cases, we help the Board and executive management make the big decisions: on strategy, marketing, operations, technology, human resources, internal organisation, capital raising, mergers and acquisitions. In a select number of cases, Twoeyes may take an equity investment position in the business venture and assume a pro-active ownership role in driving the business over the longer term (see Equity Investment for more information). In any case, we help enterprise leaders find where to make their money, make more of it faster, sustain growth for longer and make the company more valuable. We realise that helping a business undergo transformational change and strategic growth requires more than just consultants’ reports and recommendations. So we work in and on the business, from the Board table through to the reception desk. Rolling up our sleeves for the long haul, we try to put ourselves in our clients’ shoes and focus on immediate practical actions. At the same time, we start every engagement with the end in view and craft an achievable strategic growth plan that links back to the important issues that need to be addressed immediately. By concurrently linking strategic and operational plans, all our efforts are focused on increasing the value of the owner’s equity. We do this by reducing risk, as perceived by the next round of equity investor, potential acquirer or known successor. 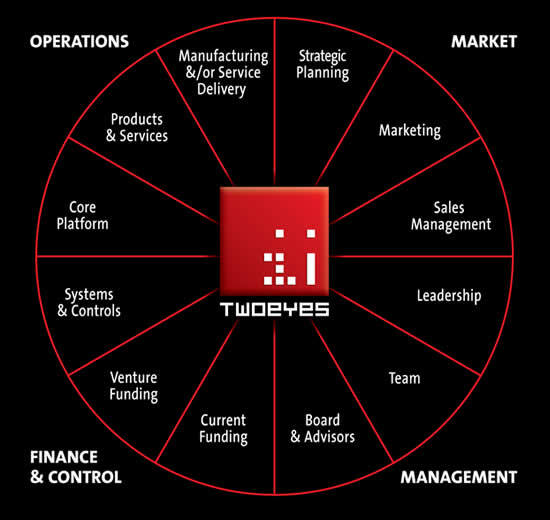 Since 2000, Twoeyes has evolved – and continues to develop – a clearly thought-out Enterprise Development Management System for assessing, developing and strategically growing organisations that consistently meet their milestones. The Twoeyes Enterprise Development Management System influences our strategic advisory approach, from the initial engagement with the organisation and throughout our active engagement in the project. Central to this Management System is the ‘Twoeyes Enterprise Insight’, illustrated above. The ‘Twoeyes Enterprise Insight’ is a tool used to assess and guide the development of an enterprise in a structured manner, across 4 Key Quadrants and 12 Critical Segments. The Enterprise Insight structure is used as a framework to clarify the key operational issues that need to be addressed in each key segment and develop a plan of action that is linked to the enterprise’s key strategic objectives. Since its start in 2000, Twoeyes has identified and developed strong relationships with a core group of expert service providers in each of the 12 Segments of the ‘Enterprise Insight’. Using the ‘Enterprise Insight’ framework, Twoeyes produces an ‘Enterprise Blueprint’ that highlights the areas of under-development across the organisation and clarifies a plan of action to address them. Once the ‘Enterprise Blueprint’ is developed, Twoeyes can match the requirements with the expert skill sets within the Twoeyes team of Growth Advisors. A Strategic Growth team is then assembled and the Enterprise Blueprint is actioned under the leadership and direction of Twoeyes Managing Director, Conor McKenna. Once the assignment has been completed typically over a 3 – 5 year period, the virtual team disbands, just like any construction or IT project. With Twoeyes Lead Advisor driving the project from the front seat, the client benefits from a hand-picked team skilled specialists the calibre of which few businesses could muster themselves. For further information about how we work, please contact our Twoeyes Managing Director, Conor McKenna, directly on 0402 264 670 or email [email protected].